Oh look. It’s the obligatory LudoBites 4.0 post on e*starLA. Like it’s really an LAÂ food blog without it, you say. Well, you’re right. So while I’m at it, I’ll also remind everybody that 1) It’s completely booked, but also: 2) There are always cancellations. Follow Krissy Lefebvre (@frenchchefwife) for notice of these cancellations. And after you score that reservation, remember to BYOB it. A great wine shop to consult for your purchase is Domaine LA (@domainela), where Jill recommended a lovely ’08 Santa Maria Valley Pinot Noir that got rave reviews from my tablemates. Also check out the recommended wine list for LudoBites diners. 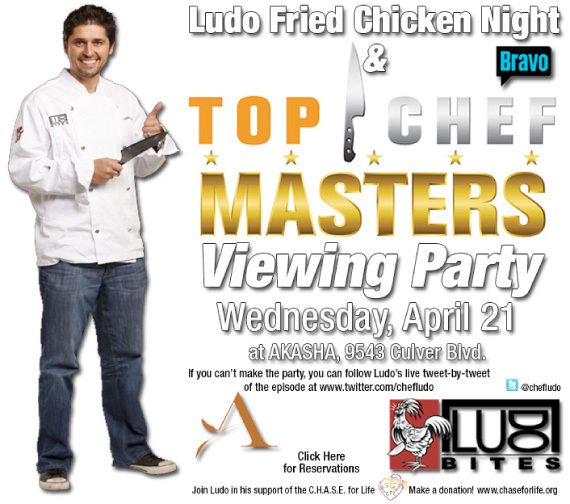 Last night was another Ludo fried chicken night at Akasha which doubled as a viewing party for Ludo’s return to Top Chef Masters. It wasÂ buffet-style and some lucky diners got to take home the leftovers. I was not so diligent in securing some for myself, I’m sad to say.Â But it was so fun to see how our favorite social media-entwined chef got “cast” as the crazy Frenchman in reality TV land, getting 100% subtitled and well, playing the part quite expertly.Â TheÂ party attendees sat and watched the episode intently, whileÂ smug that we gotÂ to experience Ludo’sÂ drama – live and in the flesh. 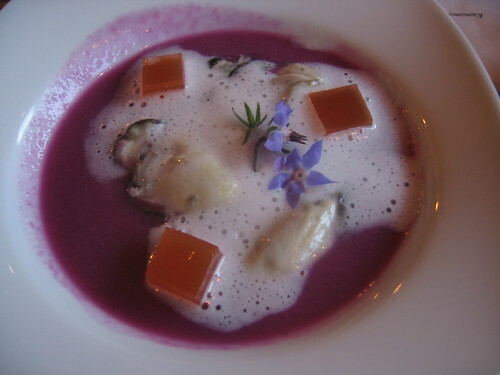 I love all the daring contrasts in flavors that Ludo features in his dishes, especially when it comes to soup. I’m sorry, I meant veloutÃ©. Why yes certainly, it is velvety, which is such a perfect background for when the salmon roe delivers a sort of salt shock. And the candied olive is actually sweet, yes. The fennel gave the dish its center texture and had good flavor. It blew my mind – because it’s not every day where you are treated to food that requires that you think. Ahh…Ludobites is back. I also loved the Red Snapper Ceviche – a dish I couldn’t figure if more flavorful or refreshing. Jalapenos and red onions gave it a proper kick while tomatoes were an effective cooling agent. I snuck an extra helping of this one onto my plate. The scallop dish was an adventure of sorts, combining the perfectly seared bivalves (with that perfect ring on the outside) with almond puree and cauliflower ice cream. There were many little nuances from all over the place, especially when you also combined them with the pickled grapes and curry oil. 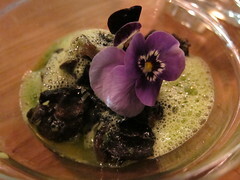 The bite, however, wasn’t complete until you included a little of the caper paste smeared onto the plate. And after that was done, I found myself going back to the cauliflower ice cream – just to make sure it really was cauliflower that I tasted in the creamy – yet quickly melting – cold scoop. There were super-thin slices of raw cauliflower on top of each scallop which together were drizzled in a slightly spicy curry oil. It could’ve been just another November Friday night in L.A. of standing in line outside just to stand shoulder-to-shoulder inside. 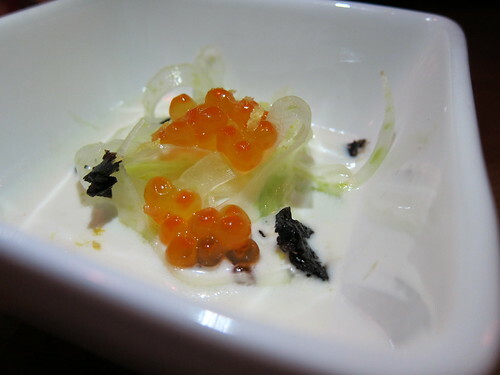 But no – it was Culver City not Hollywood, and this pop-up culinary experience called “LudoBites” came packaged inside a Japanese cosplay cafe accented with a concurrently naughty theme. That theme would be “In Bed Together” – in regards to the displayed art around the cafe – and the French chef’s wife would have a … rooster on her back. There were the standard passed appetizers like tuna carpaccio, steak-wrapped asparagus, French fries and miscellaneous toasts that would satiate us aside from the dishes du jour. 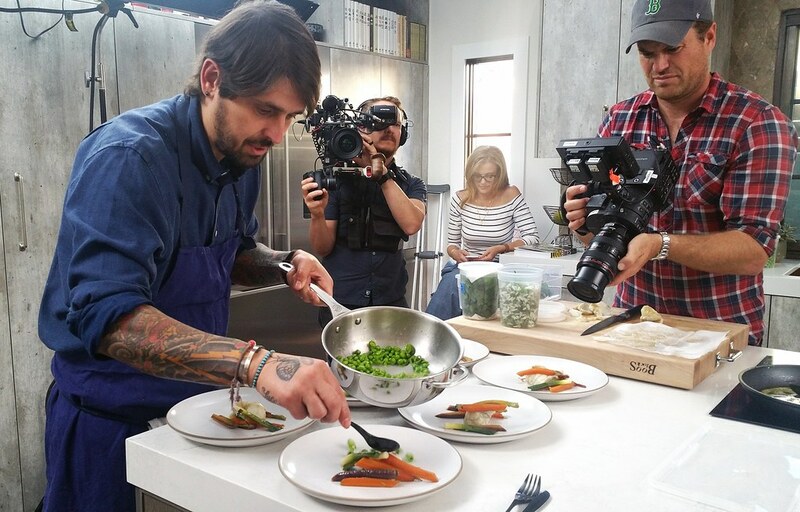 Chef Ludo Lefebvre himself would be encased inside a glass box in the center as guests filed into that box on one side of the velvet rope while not necessarily exiting on the other. Bright lights. It was hot in there. 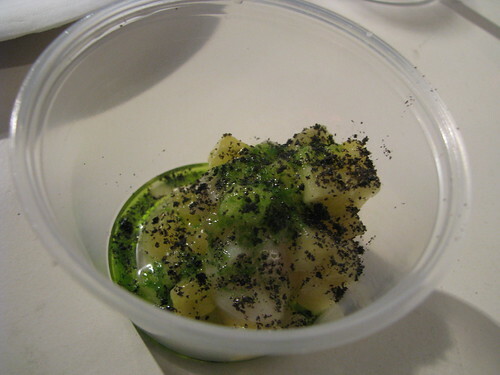 But that didn’t stop Ludo from fixing hundreds of Solo cups filled with a delicious mixture of scallop crudo and pineapple in brown butter – all of which came dusted in dark specks. 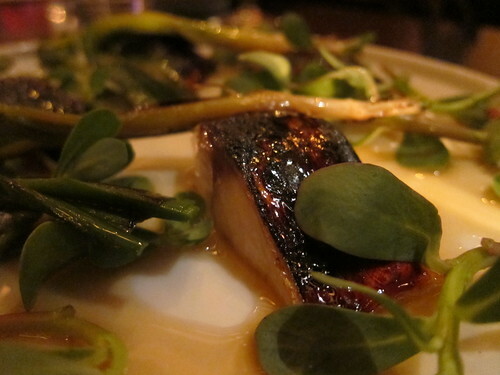 Hey – we all love butter but the surprising thing about the dish was how light it was. 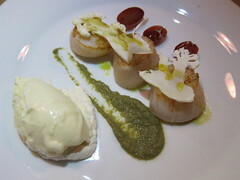 The sweet pineapples were perfect in highlighting the mild flavor of fresh scallops. The salty squid ink brought everything out together. It was just another ordinary day in Twitterverse. I work nearby the Miracle Mile outpost of the ongoing food truck revolution. My target today would be the Grilled Cheese Truck andÂ I would ultimately miss – thanks to their popularity and resulting 30-foot line. From what it looked like, the line was stagnant and my suited arse had to be back at work. “Aborting @grlldcheesetruk, the line is 30 feet long. I need to get back to my day job,” I lamented. Yes. Do: Let me know. And she did – right away. It was tentative but not expected, and that was enough. The bulk of the news was exchanged in Twitterland, and to round out the story: They’re between two places for LudoBites’ next stint after Royal/T – which, by the way, hasn’t even started yet and has been sold out since last week. Never fear. 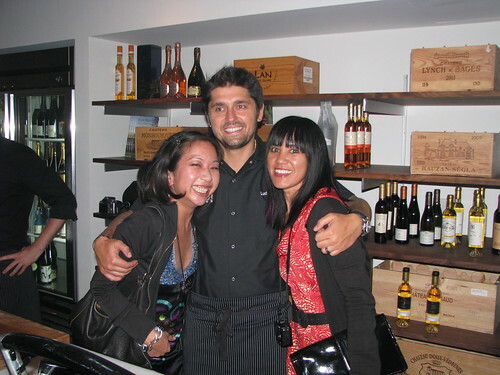 They’ve been planning for mid-January 2010 at the earliest for their next potential lunch and dinner spot. Yes, lunch! Squee…!! P.S. – Culver City would be peachy. Kthx.